Two new Chinese nuclear power units - Changjiang 1 and Yangjiang 3 - have moved closer to commissioning by achieving a sustained chain reaction for the first time. Both reactors are expected to begin operating later this year. Unit 1 of the Changjiang nuclear power plant, under construction on China's southern island province of Hainan, achieved first criticality at 3.39am today, China National Nuclear Corporation (CNNC) announced. Initial approval for the Changjiang plant's construction was granted by China's National Developmental and Reform Commission in July 2008. Early site works began in December 2008. Construction of unit 1 began with the pouring of first concrete on 25 April 2010, while that for unit 2 was poured on 21 November 2010. The loading of the 121 fuel assemblies into the core of Changjiang 1 - a 650 MWe CNP-600 pressurized water reactor - began on 26 August. Changjiang 1 is scheduled to begin operating by the end of 2015, with unit 2 set to start up next year. 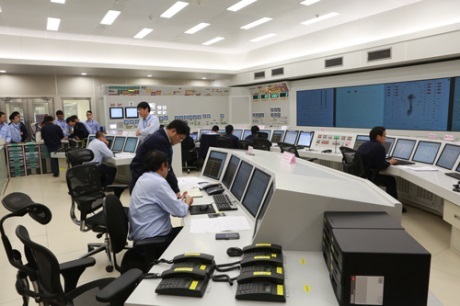 First criticality of Changjiang 1 came just a day after the same milestone at unit 3 of China General Nuclear's (CGN's) Yangjiang plant in Guangdong province. That unit achieved first criticality at 7.50am on 11 October, plant builder China Nuclear Industry 23 Construction Company Limited announced today. Six units are planned for the Yangjiang site in China's Guangdong province by CGN. The first four units are 1080 MWe CPR-1000 pressurized water reactors, with units 5 and 6 being ACPR-1000s. Unit 1 entered commercial operation in March, while unit 2 began commercial operation earlier this month.